Food is an integral and crucial part of our health and well being. Ask a hotelier they will tell how important it is to simplify the commercial kitchen in their business. Cuisines are like working on art, where the fine tuning always yield better results. Hotel Total, a top notch kitchen equipment and solution provider is delivering best service for hoteliers. While setting up a new hotel or refurbishing the existing kitchen you put in a lot of effort. The Hotel Total team identify itself with your honest efforts to have the best kitchen. Our services are designed around the daily requirement of a hotelier. In order to achieve best quality food output at your hotel you need the best equipment. There are pertinent solutions for every arising problem in a hotel or café business. The reason why you must choose a service provider like Hotel Total is quiet simple. We help you choose the right solutions with affordable budget best suitable for your kitchen. 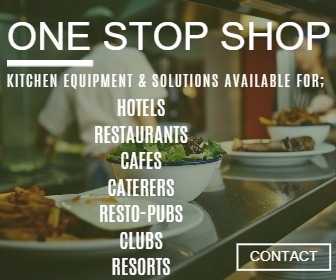 In most cases of our consulting, the hotelier has saved a lot of money with our investment inputs on kitchen equipment. Time is money for a businessman, while you are busy working on the other issues we fix problems at your kitchen. Solutions offered at Hotel Total are implemented by several top players in the market. We are one of the leading companies bringing substantial improvement in the kitchen output. Once your food quality is upgraded the customer base significantly improves. Those who are setting up a new restaurant can have exclusive inputs before allotting budget for your commercial kitchen. We work with leading manufacturers and suppliers of domestic and imported kitchen equipment. There are several brands available with us for your comprehensive shopping. Besides, the long list of products we also fetch you the best quote to save your money. Then what are you waiting for? Log on to HotelTotal.in designed exclusively for Indian hoteliers. Plan your hotel business efficiently to save money and leave less carbon footprint by using high quality equipment. The holiday concept has evolved to a different level in the minds of travelers in this century. Today the guests look for a new experience each time they travel. Alternate holiday rentals are quiet popular for people looking for experiential holiday. Home stays are one such segment which are popular for their authenticity. Thirthahalli in Malnad region has several homestays for your comfortable holiday. Thirthahalli is a Taluk in Shimoga district which is close to the Western Ghats in Karnataka. One can visit Thirthahalli, Western Ghats and Coastal Karnataka as connecting destinations. They are around 1 to 2 hours’ drive distance from each other. Choose to holiday at homestays in Thirthahalli to experience Areca planters’ lifestyle. The hosts of the home stays in Tirtahalli are basically agriculturists. The guests will get to see the agriculture activities during their luxury holiday accommodation. TravelChords is the brand that boasts for creating trips and itinerary for people visiting Tirthahalli since 12 years. We have designed services after understanding the pulse of 21st century travelers. You can compare prices and facilities to choose the best option as per your requirement. Take a free quote with us online and choose a best trip that saves your time and money. Only best stays are listed by TravelChords and guests can safely book on the portal instantly.